Have the life you want! Start now! Helping you become a Great Homeowner! The Spring Market is here! 2019 is off to a roaring start with continued low inventory and firm pricing. We're now taking appointments for buyer and seller consultations for the 2019 market. Contact us today! Click Here To Reach Us Now! We work in All of Northwest Boston. Where do you want to be? 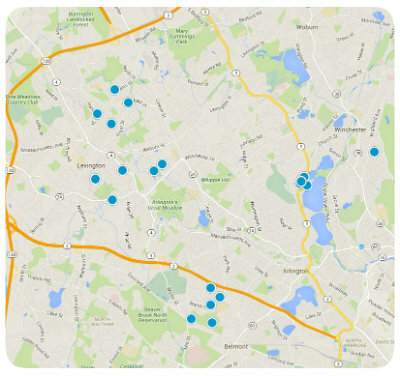 We help Buyers and Sellers in Arlington, Lexington and Winchester, Mass and many other fine communities. The Mark Lesses Group is a team in Coldwell Banker that are highly qualified Real Estate professionals committed to providing the highest quality of service in Arlington, Belmont, Lexington, Winchester and all of Northwest Boston. If you are looking for a Real Estate experience that is easy, thoughtful and successful, contact us today! With over 20 years of experience, our market knowledge in ALL of Northwest Boston can help you buy or sell your home. Not in our area? Don't worry, we have partners in other communities that we don't cover as well as out of state partners Reach Us Now to get started. Online valuations are only estimates. The only way for us to understand the value is to schedule a home visit! Ready to Explore Our Neighborhoods?